Roswell's Joe Bauman was the Babe Ruth of minor league hardball, the Sultan of Sandlot Swat. Jim Waldrip, an 86-year-old resident of the town, is our rattled tour guide. He has agreed this spring afternoon to show a writer and a photographer the sights of Roswell. Not the Roswell where aliens from space supposedly dawdled, but the Roswell where he watched a real-life legend launch baseballs into space. Semi-arid and flat as a fritter, Roswell holds its sports heroes in high regard. The local pantheon includes LPGA legend Nancy Lopez, who grew up here; former Dallas Cowboys quarterback Roger Staubach, who prepped for the Naval Academy at New Mexico Military Institute; and an amiable, uncomplicated gent named Joe Willis Bauman. No average Joe, Bauman was the Babe Ruth of minor league hardball, the Sultan of Sandlot Swat. In 1954, the hulking, square-jawed, left-handed-hitting first baseman socked 72 home runs for the Roswell Rockets of the Class C Longhorn League. The Rockets and that league expired shortly thereafter. Bauman’s mark, however, remained a record in professional baseball for 47 years, unbroken till Barry Bonds hit 73 in 2001 for the San Francisco Giants. In a sport where numbers tell a story, the legacy of that ’54 season remains eye-popping. On top of the homers that came off his bat in bunches, Bauman knocked in 224 runs and racked up a .400 batting average. Somehow, the size-XXXL slugger even stole four bases. Yet Joe Bauman’s name doesn’t resonate with many people, even here in New Mexico. A lot of this is because Bauman never spent a minute in the major leagues. He was a bush leaguer through and through. Playing at the basement level, he toiled seven summers in windswept towns of New Mexico and West Texas. Attendance spiked whenever Bauman appeared for games at little places like Sweetwater and Big Spring, Texas, or bigger ones like Albuquerque and Carlsbad. For young or old, man or woman, his arrival was like the circus coming to town. Early in his career, Bauman had signed a contract with the Boston Braves. He played minor league ball in their farm system back east, but he was homesick for the Southwest, where he soon returned. The closest he got to the big leagues came in a lone game in Triple-A, in 1948. He went hitless in his one at-bat. Back in Oklahoma, Bauman happily signed on with a semi-pro outfit and stayed there for three years. In 1952, Big Joe accepted an offer to suit up in New Mexico for the Artesia Drillers of the Longhorn League, a legit minor league circuit. He slammed 105 home runs over two seasons in Artesia, but by this time he was 30, and no major league club came knocking. The following year, Bauman moved up US 285 to Roswell. The pay was decent, and there was this bonus: Ballplayers in the Southwest could pocket “screen money,” bills that appreciative fans stuck in chicken-wire screens behind home plate. In 1954, when he bashed all those balls over all those fences, Joe Bauman went home many nights with several hundred dollars in cash. Things got even better when Jim Waldrip, his Oklahoma chum, joined the Rockets in 1955. That off-season, Bauman had gone back to Oklahoma with the Rockets’ manager to scout prospects. They convinced Waldrip, then teaching school, that he ought to come down to New Mexico. “I pretty much knew I was never going to reach the bigs,” Waldrip says. Bauman surely knew he wouldn’t be called up, either. If Big Joe regretted not reaching the Show, he did not voice it aloud. Instead, he spent his saved-up screen money to buy a gas station in Roswell, the city he would call home for the next half-century. During road trips, Bauman refused a private room. “What the heck for?” he said. And he was just as collegial at home. The Baumans—Joe and his wife, Dorothy, had been high school sweethearts—welcomed Waldrip and his wife, Jo Anne, to Roswell. At West Second Street, Waldrip says, “Hold up and take a right a little ways down.” We swing in front of a business called Car Tunes & Tint. Decades ago, this structure was the Joe Bauman Texaco. Bauman had co-owned a Texaco station on Route 66 when he played semi-pro back in Oklahoma. To him, there was no better life than running a filling station. He even brought his teammate on board. “I got paid a dollar an hour from Joe,” Waldrip says. “Spent three summers here. I did detailing and repaired tires.” Dorothy took care of the cash register, and Joe worked the pumps. 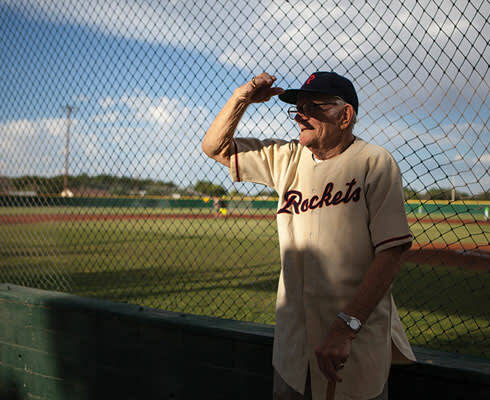 When the Rockets were playing at home, Bauman left the station at about 5 p.m. and headed off for the ballpark, a four-mile drive. Waldrip nods toward an abandoned building across the way from where the gas station stood. “That’s where Pop’s Drive-In used to be.” You could get a 10-cent hamburger at Pop’s. Their slogan was “Worst Food in New Mexico.” For years the sign attracted the curious. Now the location brings a mournful stare from Waldrip. So much is gone. Roswell didn’t witness Bauman’s record home run number 72 in 1954—that happened in Artesia, during the second game of a season-ending doubleheader. The 69th and final homer he hit at home during that summer had come three days before. Fans that night stuffed the Roswell ballpark to see Big Joe wallop a 375-footer to deep right. The Roswell Daily Record reported that the cheers could be heard downtown, two miles away. South Park Cemetery lies at the south end of Roswell. Joe and Dorothy are buried here, as is Jo Anne Waldrip. “I’ll be here, too,” Jim says. In fact, a tombstone with Jo Anne’s name and dates and Jim’s name and birth date stands two graves away from Big Joe’s resting spot. 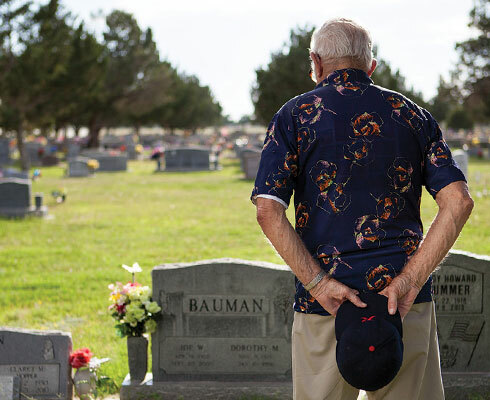 “I wanted to be right next to Joe, but someone beat me to it.” A baseball pitcher is carved into Waldrip’s headstone. He is winding up and throwing toward Bauman’s marker, which features a batter. Joe Bauman’s name can be found in an exhibit titled “One for the Books” in the Baseball Hall of Fame in Cooperstown, New York. The Joe Bauman Award is given annually to the minor leaguer who hits the most home runs. Though Bauman is remembered hereabouts, for a long time no statue or plaque in Roswell publicly recognized his feats. In August 2005, Fair Park Stadium, Roswell’s home field, where Big Joe had his grandest year, was renamed Joe Bauman Stadium Coca-Cola Park. Bauman was invited to speak at the dedication. Left frail by a stroke, he moved creakily. He hadn’t wanted to attend, but Waldrip talked him into it. “When we got there, I told the people in charge to be sure to have someone walk with Joe to the podium,” Waldrip remembers. That detail was somehow passed over. As Big Joe went to read his speech, he slipped and broke his pelvis. He died the following month at the age of 83, with Waldrip standing at his bedside. Late afternoon has arrived, and a baseball game is approaching at Joe Bauman Stadium. It’s a Pecos League game, a contest between two teams of mostly young guys fresh out of high school. The Roswell Invaders are playing host to the Douglas (Arizona) Diablos. At the sight of Waldrip’s throwback Roswell Rockets jersey, members of the home team drift over to him. “Did you play?” Rob Warnock, the manager of the Invaders, asks. Approximately 60 fans are on hand this night, an average crowd in the Pecos League. An eager young man in a golf shirt appears. He wants to know who Waldrip is. Polite applause follows. Jim Waldrip, who says his hearing in one ear is poor as a fence rail, apparently does not catch the botched intro. That’s OK, because this is all about Joe Bauman anyway, as Waldrip wanted it to be. For him, Big Joe is back in the home ballpark one more time. The legend is here, standing in his field in Roswell, along with a good old friend. You can almost hear the cheers.